Barry Hearn's plans to shake up snooker look set to get the go-ahead after a players' meeting in Sheffield. World Championship runner-up Graeme Dott, Steve Davis, Mark Williams, Mark Selby and Ken Doherty were among the large player turn-out. They are due to put Hearn's new plans for the sport to a vote in mid-June. "There was a spectacular majority of people in favour which pleases me no end. I hope it's going to be a big vote in favour," said a positive Hearn. He added: "There's no such thing as a shoo-in, it was a frank exchange." Wednesday's meeting at the Sheffield Ice Arena follows a proposal by World Professional Billiards and Snooker Association (WPBSA) chairman Hearn to take control of the sport. Hearn, who has overseen a major upturn in the fortunes of darts, is promising more tournaments and higher prize money for snooker's elite players, but ownership of the game remains a major sticking point for some. Hearn intends to take a 51% stake in World Snooker, the commercial arm of the WPBSA, with players and other stakeholders in the sport owning the remaining 49% of what would become an independent business. Former world champion Peter Ebdon has been the fiercest public voice of dissent, saying players "cannot possibly back" Hearn's ideas. "The players need to understand this is not for a year, this is not for two years, this is not for five years, this is not for 10 years, this is it, forever, gone," he has said. Lee Doyle, who manages stars including Ronnie O'Sullivan and Stephen Hendry, and leading coach Del Hill have joined in the criticism of the proposals. "I put my point across but he's not listening to me," said Hill, who was at Wednesday's meeting. "It's a win-win situation for him in there. You stand up and he cuts you down to size. He'll have a big job cutting me down to size though because I'm six foot nine." Hearn confirmed he had faced opposition during the meeting. 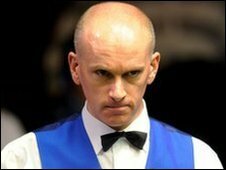 "Peter Ebdon was consistent and said he doesn't agree with it, and we discussed it and agreed to disagree," Hearn said. "He came up afterwards and said, 'I really share your views on the future, I just don't like the thought of you owning it'. But that's OK, that's the deal, vote against it. "Del Hill was treated to a full explanation of my feelings on the subject. Del might be the best coach in the world but what he knows about business can be written on the back of a packet of cigarettes." Despite the opposition Hearn believes he is on the right track and has the majority of the players behind him. "I think they've bought into the dreams and the concepts. There were some questions about ownership and I explained it's not a negotiable item," he said. "It was a very black and white session, as you'd expect, and the vast majority were supportive, which gives me a real buzz." Crucible semi-finalist Selby is among the players whom Hearn can count on for support. "I don't think we've got any choice," said the player nicknamed the 'Jester from Leicester'. "You look at what he's done with other sports, taking darts off the ground to where it's at now, and hopefully he can do the same with snooker." Dott said: "It was a good meeting. The turn-out showed it was an important meeting but obviously nothing will be decided until the vote comes."